Choose a jewelry box and find out how lucky you are! Do you want to know how lucky you are? We have a wonderful test for you which will tell you where to look for your success. 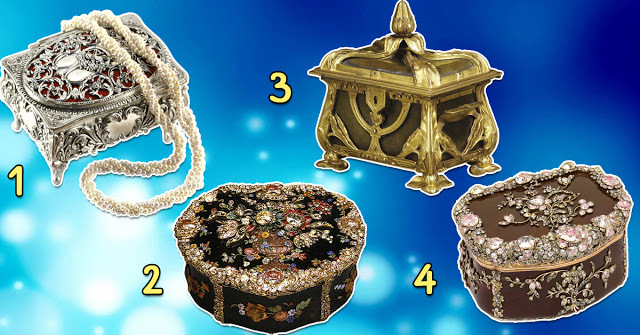 We have 4 beautiful jewelry box for you. You just have to choose one which attracts you the most. Don't think long before choosing. Let your inner voice tell you the right choice. 1. This box will bring you success. Be courageous and self-confident in your work and believe in yourself. This month will be very successful for you. You just have to be brave and don't afraid of anything. 2. This month you will be full of energy. Don't be afraid, it's a great time to take a break. You may spend a lot of money this month, but instead, your wishes will come true. 3. This box tells you that very soon your wallet will be full of money. The financial sphere will be quite successful for you. Besides, it is a convenient period to make some connections with job partners. 4. If you chose this box, then you know - you will be lucky in love. That may be a new interesting feeling in a relationship you already have. It is also a good time to make a connection with relatives.